Two weeks later, I’m still thinking about that pear tree. Man, that pear tree. 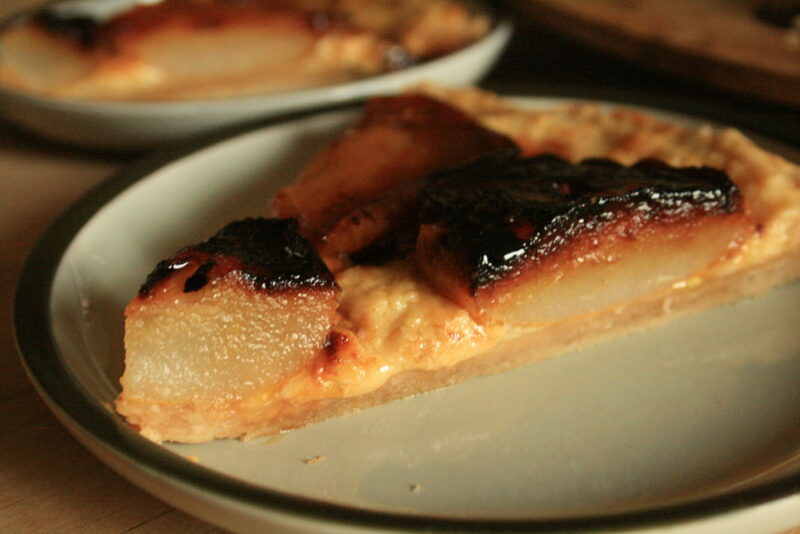 My day started off with the usual, a cup of coffee, but also a not-so-usual slice of warm, brandy-caramelized pear galette. Yes, this was my breakfast, but hey, with the homemade ricotta filling, and grass-fed buttery, wholewheat crust, I figured it was a little akin to a typical yogurt breakfast. As I savored my breakfast, I pondered why anyone would grow a tree that doesn’t produce fruit. Really, I’m serious here. Please, send me some pictures of your gorgeous non-fruiting trees to knock me out of this nonsense. This is my first fruit tree and this year, our first flush of pears. I’m amazed. It wasn’t like I was walking away with buckets or filling bagfuls for friends, but to just hold one, whole, delicious pear and know that it came from nowhere. Well somewhere, but where? That flower, that tree. But how? This whole, big pear. It feels like magic. I’m no expert at maintaining such a mindset, but in this moment, the pear tree makes that attainable. You see, I’m so used to coddling those lettuces, training up those peas, hilling potatoes, protecting the fragile tomato plants. A fruit tree is a different game, a different way, a new set of rules. I put this $30 tree in the ground and it didn’t look back. It set roots and just keeps going. With little effort on my part, it grows wider and taller, fruiting more each year. And not just a bite-sized fruit (though I am a fan of those), but these whole-palm fruits. An organic bagful of these at the co-op costs a good bit, and here they are falling from branches out my backdoor! It’s glorious. It’s a wonder there aren’t fruit trees on every block. 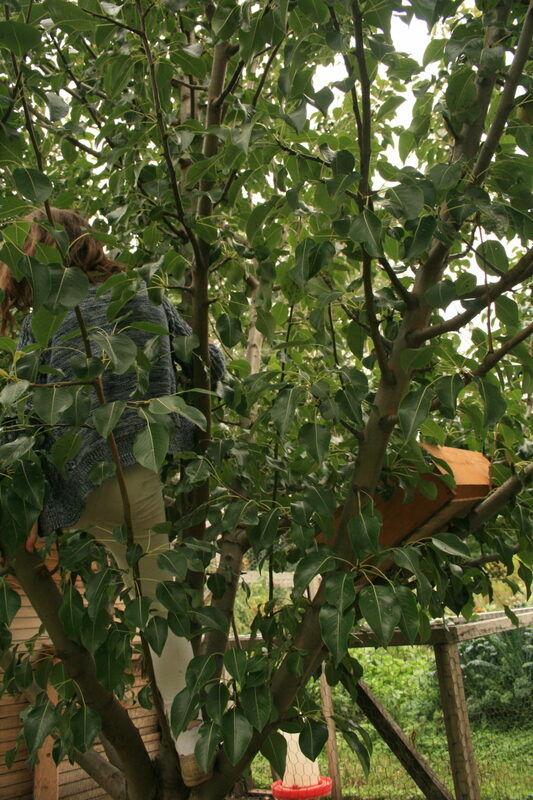 Folks, if you have any space at all, plant a fruit tree! I know many of you can grow fruits I don’t even buy at the store, let alone dream of growing. Please share in the comments. I’d love to hear about them! Fruit is a fantastic thing to grow isn’t it. I’m always looking at spare ground in the neighbourhood thinking, “You could fit a fruit tree in there”. 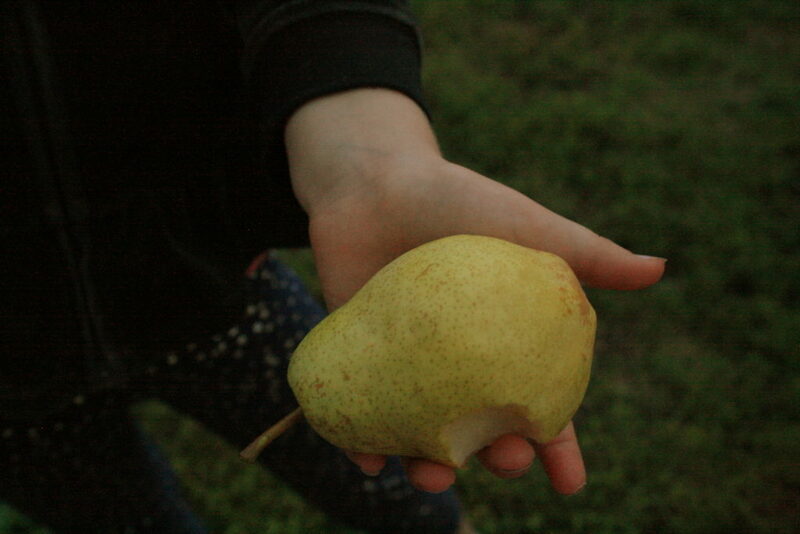 Just yesterday I was holding one of my pears and marvelling at how heavy it is. Fruit is so rewarding for such little effort. Raspberries are a favourite here as well – really low maintenance fruit. 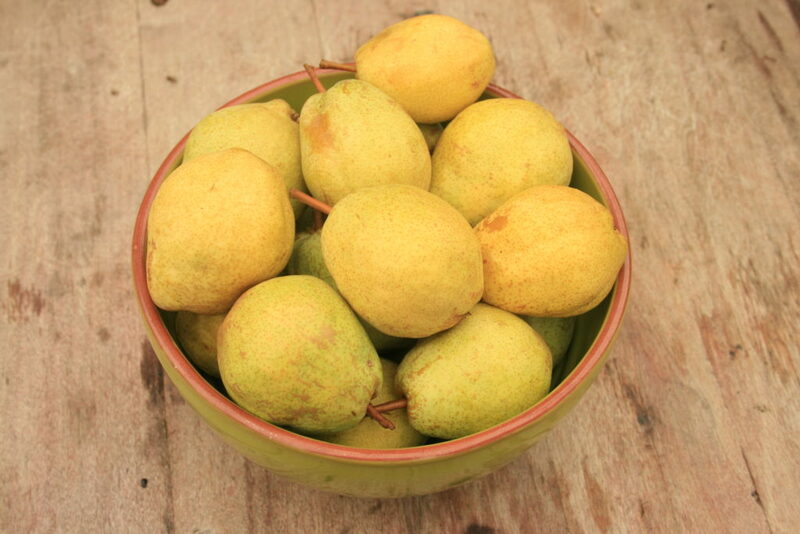 And they go beautifully with pears. Just had to add a second comment, I meant to add – do you have a fig tree? Almost no work at all, and an amazing harvest of plump juicy figs. Not to mention, it’s a really beautiful tree. And another one I want to try is an apricot. Well, everything really! Oh sounds so nice! What zone are you in? I don’t believe I can grow figs outdoors here… I have tried growing a Spanish fig indoors, but that experiment did not end as well as I would have liked!